Kids will enjoy travelling the world via 80 means of transportation. What a fun way to learn about some lesser known ways of getting around while getting a glimpse of worldwide scenery. The author has also sprinkled fun historical tidbits throughout. Illustrations completely fill each page and there are oodles of things to explore on each page. Each reading will yield new details! The last double page spread of the book provides a visual table of contents. You get a thumbnail sketch of the featured mode of transportation along with the page number. I think it would have been nice to also include an alphabetized index for ease in returning to a favorite method of transportation but admit that the unique index is fun. Makes it easy for youngsters to find their favorite modes of transportation with the book. 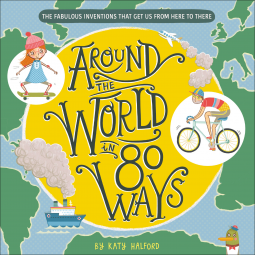 Disclaimer: I received a free digital copy of Around the World in 80 Ways from NetGalley. No other compensation was received.